Here will learn what Cross- site Request forgery in Asp.net mvc ,and how to protect our asp.net mvc application from the CSRF.Cross- site Request forgery is abbreviated as “CSRF”. CSRF is a attack in which a user login to a website like ABC.Com and after login user open other site called malicious site in other tab, then this malicious site send request to (ABC.com) valid site using existing credential or existing session for attacking the site, Valid site( ABC.com) assume that this coming request is a valid request or coming from a valid user , So it execute that request and site is hacked by the CSRF. 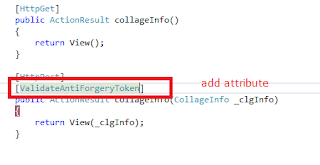 After recognizing this attack ,Microsoft provide a Attribute called “AntiForgeryToken”. 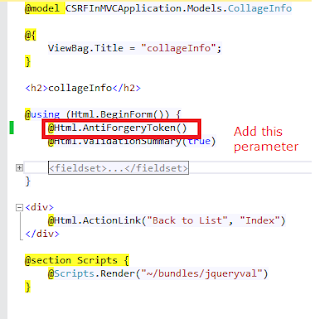 It is very simple to use in our site ,just we need to add “@Html.AntiForgeryToken” in view with that we need to add this in controller also as a attribute [ValidateAntiForgeryToken] to validating this. Basically AntiForgeryToken is used in HTTPPost method. Go to visual studio and create a new project and select a Asp.net MVC4 web application and give the name for project ,in my case it is “CSRFInMVCApplication” after that click ok then a window will open from there select a template as “Besic” and view engine as “Rezor”. After completion of model class we need to add a controller to this project so for that right click on the controller folder and a controller and give the name as “CollageController” with Empty MVC Controller template. After adding controller we need to add action method name is “collageInfo” with [HttpGet] and [HttpPost]. 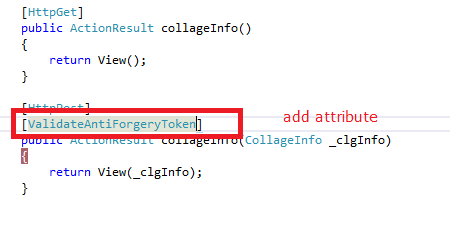 So for that write the following code in controller collageInfo action method. Now double click on html file and enter some data then click on “Create” ,this window will be same like view. now enter some data and click on “create” button . When you click on create button, you will see that this is redirecting to action method “CollageInfo” this wrong ,its called CSRF attack. Like this we can prevent from this CSRF attack.